The wrist is a versatile joint that allows us to position the hand in space to perform the most complex of functions. This requires the wrist joint to be flexible and strong. The distal radius and ulna, along with eight small carpal bones comprise the wrist. Ligaments connect these bones and a few of these ligaments are prone to injury. The triangular fibrocartilage complex (TFCC) ligament is located on the side of the wrist below the small finger and when injured can cause chronic wrist pain. The TFCC ligament is approximately the size of a dime. Many patients diagnosed with a “wrist sprain” have injury to this ligament. What is the function of the Triangular Fibrocartilage Complex (TFCC)? This ligament stabilizes the ends of the two forearm bones (radius and ulna) during grip activities and forearm rotation. It also helps cushion and suspend the carpal bones of the wrist. How is the TFCC ligament injured? There are two types of injuries, acute or chronic. A fall on an outstretched hand or excessive rotation of the forearm are frequent causes of acute TFCC tears. Chronic tears are caused by a degenerative process that wears the ligament down over time. In some patients, the ulna bone can pinch the TFCC ligament between the carpal bones due to excessive length, subsequenctly wearing a hole in the ligament. Inflammatory disorders such as gout and rheumatoid arthritis can also lead to a chronic, degenerative tear. What are the symptoms of a Triangular Fibrocartilage Complex tear? Pain is the most common symptom of both acute and chronic tears. Pain typically increases at the wrist on the side of the small finger during grip activities and forearm rotation. Many patients complain of a popping or clicking sensation in the wrist with use. Acute injury findings can range from mild wrist swelling and bruising to instability or dislocation of the distal radioulnar joint. Most TFCC tears resolve with activity modification, splinting, and non-steroidal antiinflammatory medications. If symptoms persist, a corticosteroid injection in the area of the ligament can be helpful. Operative treatment may be required for persistent symptoms despite appropriate splinting and injection. TFCC tears resulting in instability of the wrist or in association with wrist fractures may require immediate repair. What is the surgical treatment for TFCC tears? The type of surgery varies depending on the location of the tear in the ligament and the chronicity of the injury. The small ligament can be divided into three distinct zones: radial, central and ulnar (or peripheral). Tears located on the radial and central portion of ligament are typically treated by debriding or cleaning the torn edges of the ligament. 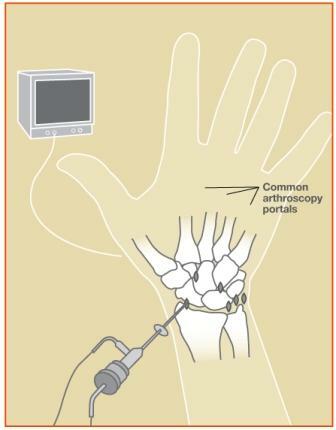 Fortunately, this can be done arthroscopically with a “wrist scope” through very small incisions (see below for arthroscopic illustration). The central portion of the ligament has a poor blood supply so repair of the ligament is not feasible. The radial portion can be repaired but is technically difficult and these tears can be treated equally effectively with debridement alone. Ulnar (peripheral) TFCC tears do have adequate blood flow to allow healing after repair of the ligament. The repair can be accomplished either arthroscopically or using an open technique depending on physician preference and specific characteristics of the injury. Chronic tears many times are related to excess length of the ulnar bone pinching the TFCC. This disorder is called Ulnar Impaction Syndrome. If the ulnar bone is too long, it typically causes a central tear of the ligament. Along with arthroscopic debridement of the tear, it can help to shorten the ulna bone to prevent re-injury. This can be accomplished by an ulnar shortening osteotomy surgery. What kind of complications can occur with surgery? Complications are rare especially with arthroscopic treatment techniques. Stiffness, sensory nerve injury, persistent wrist pain and infection have all been reported in the literature with surgical treatment of TFCC tears. If an ulnar shortening osteotomy is required, non-union of the bone and pain in the location of the plate can occur infrequently. How much rehabilitation is required after the surgery? If the ligament is debrided, strength and motion typically return quickly. The wrist is typically placed in a splint for two to six weeks after surgery and then the patient is allowed to start strengthening and stretching the wrist. If ligament repair is performed, the ligament needs to be protected and the wrist immobilized for approximately six weeks to allow healing. Incremental stretching and strengthening is then performed for the next few weeks.